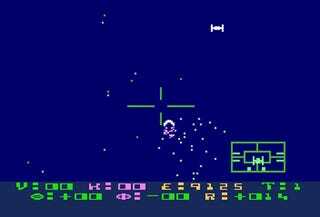 In 1979 Atari introduced the joys of first-person space combat with Star Raiders. Next year Star Raiders returns, bringing team-based multiplayer space combat to the PC, PlayStation 3, and Xbox 360. First released for the Atari 8-bit series of computers in 1979, Star Raiders was one of the first first-person perspective space combat games, and certainly one of the most popular. Atari released the game for the 2600 system in 1982 with its own special touchpad controller, which still resides in a box somewhere in my apartment to this day. The updated version of Star Raiders, first outed by GameFly back in July, should be a pretty big step up from the original. The space warps and galactic battle maps will still be in place, but they'll be bolstered by new features like battle transformations and customizable ships. Atari Reviving Centipede, Star Raiders Too? And there'll be online multiplayer, and co-op to boot. "Star Raiders has long been an important milestone in Atari's history as it paved the way for first person shooters and 3D games," says Jim Wilson, President of Atari. "Our new Star Raiders game updates this legendary shooter with new features, a striking visual style and co-op and multiplayer gameplay." Star Raiders is due out in 2011 from Atari and Incinerator Studios, the developer behind several Wii and DS games based on Disney-Pixar's Cars.